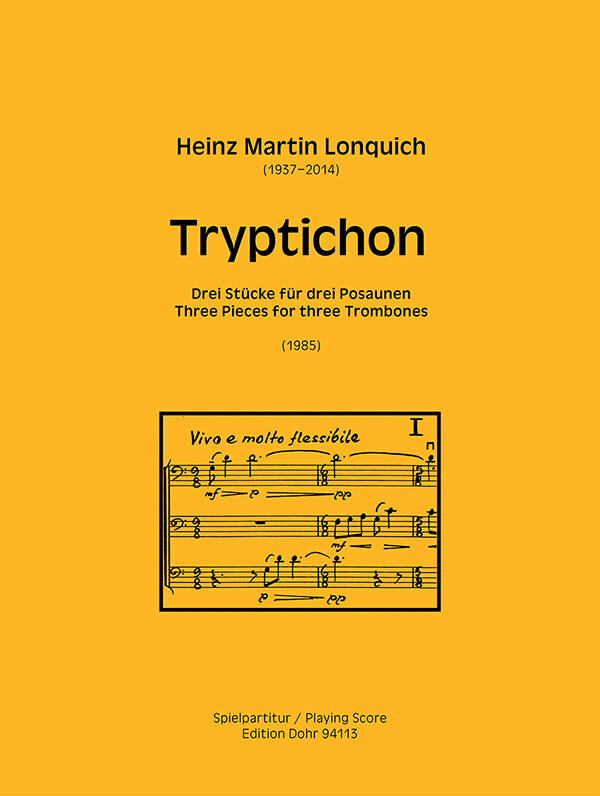 This three-movement trio, written in 1985 by German composer, conductor, and organist Heinz Martin Lonquich, consists of a fast movement followed by two slow movements. The first movement, marked Vivo e molto flessibile, utilizes constantly shifting meters, a modal harmonic language, and a contrapuntal texture. The second movement, marked Molto tranquillo, uses mutes and consists of shifting harmonic textures with long, sustained passages traded between parts. The third movement, Calmo, also incorporates a modally-based harmonic language, expressed through challenging rhythmic figures traded between players. Subdivision is obscured in interesting ways here with triplets against quintuplets, etc. The pitch range expands and contracts throughout the movement with the three players first in close harmony and later moving to more expansive voicing. A placid, canon-like ending ultimately concludes the piece. Range extends from GG in the third part to a1 in the first. Tryptichon is functional and interesting and should be easily playable by reasonably advanced undergraduate level students.